We are the leading service provider of Insulation Aluminum Cladding Service. Backed with years of industry experience, we have been able to offer finest collection of Insulation Aluminum Cladding Service. 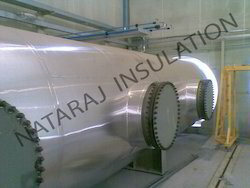 We provide this service through utilization for heat insulation in exhaust pipes. In addition to this, with the use of cutting-edge technology, we create effective results for our customers.